Backup strategies in IT are essential and expensive in terms of planning and administration, but individuals have simpler solutions. We look at five backup solutions for the desktop. Experts regularly warn about the potential for data loss, but many users, including some IT professionals, have never had a serious hard drive crash, partly because they often discard their computers before their hard drives give up the ghost. Never having experienced a catastrophic loss of files, many users simply store data sporadically on an external disk; however, this isn't a real backup strategy. More sophisticated users might employ Rsync  and Cron  scripts with their corresponding overhead, but graphical backup software, which often utilizes these command-line tools under the hood, is often a more satisfactory backup solution on the desktop. Linux users have a number of options suitable for automatic and continuous operation that allow them to save and restore files easily. These applications might even be worth using at work so that employees without root privileges can back up their data on an external hard disk or USB flash drive, allowing them to work at home or on the road. In this review, I look at Déjà Dup , Back in Time , Sbackup , luckyBackup , and Areca Backup . The tools I discuss here aren't usually suitable for full system backups, including partitions. In such cases, you would turn to Clonezilla , ISO Master , or Partimage . The desktop applications, on the other hand, store folders and files, either on the same computer (not recommended), on external drives, in the local network, on remote servers, or even with cloud providers, who also encrypt the data. Another important thing to know when making backups is whether the software creates incremental, differential, or delta backups. Although incremental backups only temporarily store the modified files from one full backup to the next, saving disk space, the system has to put all the puzzle pieces back together when restoring them, which can take a while. Differential backups, on the other hand, collect the modified files, which takes up more space; however, the backups can be restored more quickly. If you have to back up large files that grow or shrink, you will only want to transmit tiny changes and not the whole load each time (e.g., VM images). Delta or block-level backups, which split files into small pieces and secure them with rolling checksums, accommodate this situation. One drawback is that such backups can't be recovered manually in an emergency. Those just wanting to back up two or three folders containing text, spreadsheets, and graphics don't need to worry about space problems. Consecutive full backups without compression will be fine in these cases. However, because even the home environment can involve significant volumes of data (e.g., video or RAW photography files), the software will have to deal with space issues. Does it even notice when a disk is full, and does it report that fact? Also, how does it determine when to delete old backups? Your unique situation and requirements will determine your backup strategy, which will decide what software you choose to implement this strategy. In the tests for this review, I used an up-to-date Ubuntu Gnome 15.10. The packages available for this distro are typically available from the Debian repositories. Déjà Dup  is the obvious solution for simple, incremental backups. The desktop developers have integrated the software seamlessly in Gnome and Unity, and its simplicity is impressive. The Overview window after startup displays the Restore and Back Up Now options (Figure 1). Déjà Dup uses deja-dup-monitor, rather than Cron, to activate scheduled backups with the switch at the top right. Figure 1: Impressively simple: The Déjà Dup startup window. Being able to fine-tune the timing of backups has been sacrificed in favor of usability. If you enable scheduled backups, you can back up either every day or every week – these are the only options. However, even that is more methodical than manually backing up data from time to time. You can determine whether backups stay in the archive for At least six months, At least a year, or Forever. The last option is the default; however, Déjà Dup does delete old backups if the target location is running out of space. Déjà Dup accepts various storage locations: whether SSH, Samba, NFS, FTP, or WebDAV. The data can even be moved to the Amazon (S3) and Rackspace cloud and can be encrypted (Figure 2) using GPG and symmetric ciphers. Figure 2: If needed, you can encrypt your backups. If you do, make sure to remember your password; otherwise, the recovery operation is very tricky. Users can specify which files they want to back up in the Folders to save and Folders to ignore tabs. Inclusions and exclusions cannot be defined using regular expressions. The Help dialog, which can be accessed under Backups, indicates that Déjà Dup by default doesn't back up some folders, such as caches, thumbnails, and Flash content. For Déjà Dup to work, you need to be logged in to your user session. Although it's possible to operate Déjà Dup from the command line, you would be better off turning to Duplicity , which Déjà Dup runs under the hood and which provides more options . Assessment. Other than the well-thought-out design, Déjà Dup not only supports backups encrypted with GPG, it also pushes them to the cloud on request. Another important feature provided by the Restore function is that backed up files can be rolled back to an earlier version by right-clicking in the Nautilus file manager. In doing so, users receive a kind of version control, allowing them to recover files in a user-friendly manner. One clear disadvantage is a lack of profiles: It isn't possible for several users to use one desktop or for one user to back up folders to different locations. The non-granular scheduling might not satisfy some users, either. Some users have complained about encrypted backups that can no longer be decrypted, but a manual emergency solution appears to be available from the command line for this situation . If you search for this name on the Internet, will find hits for the popular "Back to the Future" trilogy from the 1980s. 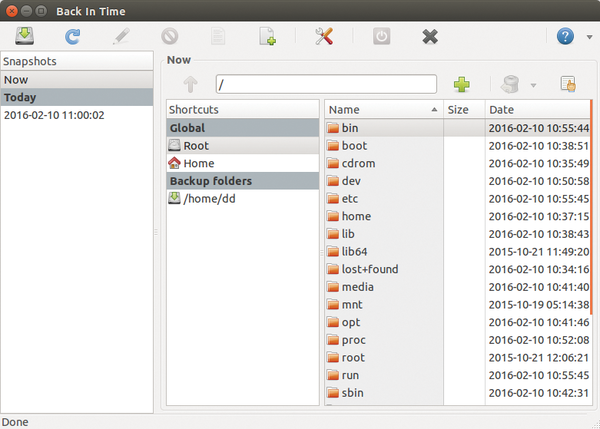 Knowing how things went wrong in that movie is hopefully not an omen for the backup solution named Back in Time  (Figure 3), which you can find in the Ubuntu repositories in two versions: one for Gnome and one for KDE. Figure 3: Back in Time shows the snapshots on the left and content on the right. Unlike Déjà Dup, Back in Time uses Cron, runs jobs automatically with Anacron, and offers profiles. 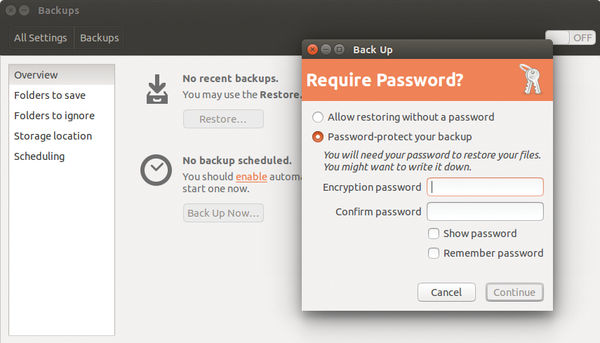 After starting, users automatically end up in the default Main profile in the Settings dialog, where they can access details about the backup process in the tabs. To add other profiles, click on the Settings icon in the toolbar. Back in Time offers traditional fare in terms of backup targets: You can store files locally or via SSH, with an option to encrypt the payload in both cases. If you want to use Samba, you will have to use a workaround: Samba shares can be mounted on the computer with the backup software with cifs-utils and /etc/fstab. The handling of automatic backup is significantly more flexible (Figure 4), ranging from Every 5 minutes to Every Month. Notebook owners are likely to be interested by the Daily (anacron) option, and the developers have even thought about external hard drive users with the When the drive get connected (udev) [sic] backup option. It is also possible to back up At every boot/reboot or to stop the service with Disabled. The inclusion and exclusion of files works as before, except that you can use regular expressions for excluding folders and files. 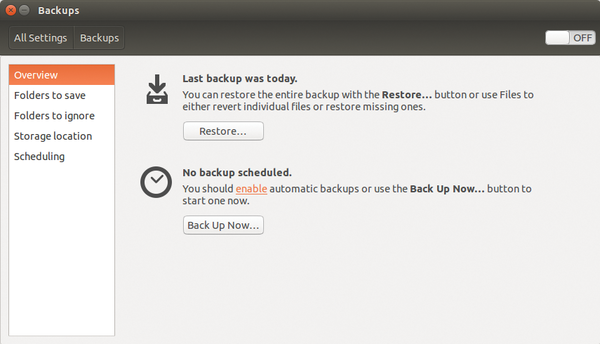 Figure 4: Back in Time has numerous backup intervals. It also responds if a user plugs in a USB flash drive. Space management supports granular options. Back in Time deletes backups that are more than 10 years old by default, or if the remaining storage space drops below 1GB or the free inodes fall to less than two percent. Anyone who doesn't want to just get rid of old backups can click the Smart remove checkbox and choose how the software should thin out its snapshots. Even more choices are available in the Options and Expert Options tabs. For example, one option checks for changes and doesn't generate any new backups if none are found, and you can check for changes using checksums. Back in Time logs All by default, but the software still carries on with its work if it finds errors in the snapshots. Notifications are enabled and experts can also set the priority for a Cron job, throttle the Rsync bandwidth if desired, or preserve ACLs and extended attributes. Assessment. Rsync, cp, and diff carry out the work in the background. Because Back in Time uses Rsync, local and remote filesystems need to support hard links for unchanged files. Initially, Back in Time excludes files with a prefixed period (dot files) from the backup. Compression is also missing, which is a real pain for large data sets. On the other hand, Back in Time is much more flexible than Déjà Dup in some respects, especially concerning backup intervals and snapshot management. The restore function works well: You can just select a file, right-click, and then choose Snapshots. The previous revisions to the file now appear with the capture date and time. Right-clicking again on the selected candidates lets you Diff the contents of the file with another or restore it. Sometimes you just need to back up a few directories on a computer, not administer a distributed installation or an array of disks. Areca Backup gives you hassle-free backups of individual hard drives. Fully automatic and space-saving backups – that’s what luckyBackup promises. This tool combines Rsync with other techniques into one comfortable application for backing up data.